At the time when the majority of mankind has moved away from life's natural ways; when illness caused by a changed attitude to life, threatens; we should turn again to medicinal herbs which God in His Greatness has provided for us since time immemorial. As a renowned European herbalist, said: "There is a plant for every illness!" For years now Maria Treben's distinguished book "Health through God's Pharmacy" has been at the top of the bestseller list on the German literary scene, selling several million copies. Thousands of testimonials have poured in from all over Europe praising the astonishing healing and rejuvenating effects of the herbal recipes in "Health through God's Pharmacy". Because the recipes are clear, concise and easy to understand, healing with medicinal herbs is now something that everyone can learn and apply themselves. 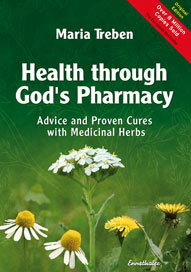 Buy now "Health Through God's Pharmacy"!